This is my second book review for the Women of Genre Fiction Reading Challenge at Worlds Without End. I’m back on schedule—just barely! 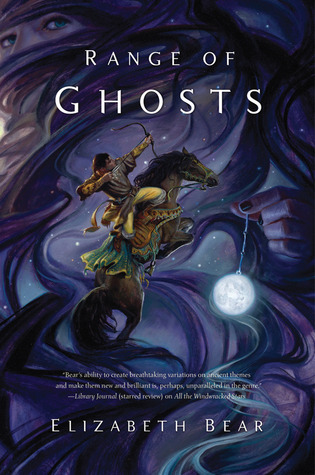 Range of Ghosts by Elizabeth Bear is the story of an empire falling apart. The Old Khagan is dead, and his nephew Temur is left for dead on the battlefield. However, in a land where each of the Khagan’s living heirs has his own moon in the sky, his survival is no secret, and his uncle is determined to hunt him down. His first instinct is merely to get away, but when an enemy sends the ghosts of his people to capture his bed-mate, he sets out on a quest to reclaim her. Along the way, he joins with the wizard and once-princess Samarkar to stand against a hidden cult that seeks to play Temur and his uncle against each other and conquer their people. The language in this book was beautiful. Not overly showy, but fluid and graceful, effortlessly leading me through the story. The love scene early on is one of the most poetic I’ve ever read. Lots of great female characters: wizards, warriors, horsewomen, grandmothers, princesses, an even a female king. And horses; Temur’s mare Bansh truly was a character in her own right. I always love seeing a range of strengths. Looking back on it now, this book was actually very heavily populated with women. Given that a lot of the men all killed each other off before the story started, that makes a lot of sense. My favorite part was the magnificent world building. The feel of the silk-road fantasy world was very solidly Not European, from the Rasan custom of sticking out your tongue to show respect to the life of the steppe clans, with their horses and white-houses and true names. The sky changes to reflect the god of whomever holds power in the land, and the gods seem very close. It was incredibly refreshing to get away from the familiar old tropes, but in some ways it also placed an extra layer of distance between me and the characters. It felt more like watching a grand adventure unfold than being plunged into the midst of one myself. I enjoyed the story, but I wasn’t emotionally invested. I wasn’t compelled to keep reading. I feel bad about saying that, because it really is a great book, and I’m planning to read the sequel when it comes out. I think it probably says more about me as a reader; the emotion is all very subtly drawn, dipping very shallowly into the characters and letting their feelings come across mainly through their actions and the choice of description. Quite different from a lot of my other reading fare, and requiring more concentration on my part. I went into this book thinking it would probably end up on my Hugo nomination ballot. I’m not sure it makes it into my top five, but Range of Ghosts is definitely in contention. This entry was posted in Reading, Review and tagged fantasy, WoGF by Emily Sandoval. Bookmark the permalink.